A small group of committed activists can make a difference in their communities. The Fort Lewis College Environmental Center is a wonderful organization that has reached hundreds of students through the years; their two person staff has taken on this large project with some volunteers and great aplomb. Top speakers are willing to come to a little community such as Durango. Katharine Hayhoe will be in Canada, but she will reach us by a video made just for this symposium. We will also be showing one of her YouTube videos. Travis Rieder will be at his office at Johns Hopkins University but communicating by Zoom. Dr. Rieder spoke in Durango a couple of years ago and won a lot of praise for his presentation on the ethical imperative of having small families. Do you remember the politicians in North Carolina who passed a law in 2012 that prohibited calculating sea level rise based on climate change predictions? They said only historical trends could be used. That law, promoted by real estate developers, postponed planning for the consequences of climate change. Only 6 years later they were visited by a wrathful storm that dropped 3 feet of rain on parts of the state! I wonder how the legislature feels now that they have been visited by reality in the form of Hurricane Florence. (Although the law concerned sea level rise, immense precipitation caused the damage.) My hope is that legislators have learned that they cannot mess successfully with the laws of nature and physics. Many of the changes we’re experiencing now are due to anthropogenic (human caused) climate disruption. The list includes more destructive hurricanes; the estimated cost of Florence is 38 billion dollars and the human toll is 53 deaths. Yet Scott does not believe in climate change. Apparently staff at the Florida Department of Environmental Protection were told not to use the terms “climate change” or “global warming” after he became governor. Why have we been punished with so many destructive storms recently? Part of the problem is that governments are failing to recognize that climate change is increasing the frequency of these deadly and costly storms. Even a slight increase in the air and water temperatures gives significantly more energy to form cyclonic storms. Senator Inhofe of Oklahoma wrote a book about climate change titled “The Greatest Hoax”. I don’t think that people in Florida and the Carolinas will be reading that book much now. How is it possible that some people who don’t believe that climate change is real, or think that it is all just natural cycles that are causing it? How is that possible when these people know that humans are increasing greenhouse gases in the atmosphere? How does one talk with someone who denies climate change? “Climate Change Solutions” is the second symposium at Fort Lewis College on the subject. It will be held Tuesday October 30th. Last year’s meeting focused on the science, this year will focus on ways that individuals can help deal with this global problem. Climate Change Solutions will have 2 sessions, starting at 12:30 and 6:30, at the Community Concert Hall on the Fort Lewis College campus. Because cimate change will affect today’s kids much more than my generation, we have invited several hundred students from area high schools. All College people will have free admission. A member of US Senator Michael Bennet’s staff will urge people to vote for politicians who don’t deny climate change, and update us on what is happening in Washington to fight this global disruption There will be suggestions about effective ways to talk to climate change deniers. Another speaker will tell us about the most effective way to quell climate change. You guessed it! Climate change is really a symptom of overpopulation and of overconsumption. Choosing to have a small family is the most effective action in the long run an individual can take. We also need actions that will work in the short run. For more information about Climate Change Solutions and tickets search the calendar at: https://www.durangoconcerts.com. I hope to see you there! I morned the 17 people who were killed in the mass school shooting in Florida. Then I realized that I have a granddaughter who is in high school, and that her life might be in danger; this made me feel afraid and angry. Why should a 14 year old have to worry about getting shot at her school? Every year there are more than 37,000 gun deaths in the USA, including about 22,000 suicides. 2017 was the worst so far, with 15,591 homicides. Incredibly, there were 732 children and 3234 teens who were injured or killed by guns. These are data from the Gun Violence Archives. You probably know already that the USA has many times the gun violence of any other developed country. Why? Although mental illness is blamed frequently, it should noted that 98% of people pulling the trigger are men. Women also have mental illness, but they are much less responsible for shootings. Male aggression (!) and the easy availability of guns are contributing factors to most shootings. Unfortunately, our government has not taken responsibility for the ease with which guns can be purchased. Indeed, in 1996 an amendment to the omnibus spending bill stated: ”…none of the funds made available for injury prevention and control at the Centers for Disease Control and Prevention may be used to advocate or promote gun control….” This has effectively halted research into gun deaths. How did this happen? Certainly the deaths of thousands of Americans is a public health crisis! The National Rifle Association wields immense power in Washington; it was they that effectively put a stop to gun injury research. The NRA has bought our senators and representatives. All told, the NRA has given Colorado Senator Cory Gardner $3,879,064, according to the New York Times. Gardner’s comment after the Las Vegas shooting was: “My family and I are praying for the families of those injured and killed….” He has not taken any substantive action to stop the shootings. The Washington Post wrote that Representative Scott Tipton has received $19,950 from the NRA. Shootings are a terrible way to reduce our population! In my series of bad ways to decrease human numbers, this is one of the worst, since shooting victims are often young people. What can we do to reduce the slaughter? I offer several ideas. Another idea is to require gun owners to purchase insurance, just as car owners do. Then if you, or a gun you own, shoots someone, the insurance would help with bills. The effect would be strong because insurance companies would pressure gun stores to keep guns out of the hands of the wrong people, and limit assault weapons. Already PayPal, Square, Stripe and Apple Pay don’t allow their services to be used for the purchase of guns. Andrew Ross Sorkin suggests that all financial institutions—including banks and credit card companies—should stop doing business with retailers that sell assault weapons, high-capacity magazines and bump stocks. This would not be a cure, but it would be a step in the right direction for the sickness of shootings. Nicholas Kristof has an excellent online essay “How to Reduce Shootings”. It is a clear statement of the problem, and includes 9 ways to approach a solution. One of them is to research “smart guns” which require a PIN or fingerprint before they can be fired. 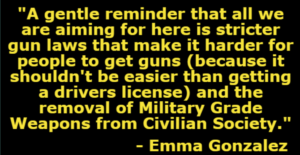 I am pleased that teens such as David Hogg and Emma Gonzalez, both quoted above, are stepping up to be gun safety activists. Please join me on March 24th at a local March for Our Lives. Starting at 1PM we will meet at the Durango High School parking lot and march to Rotary Park. Wendell Berry is a renowned writer of prose and poetry, and an activist. Now in his 80s, Berry has given up the bright lights of New York and Palo Alto where he has taught and lives on a farm in Kentucky. Berry is facetious when he writes “Love the fast profit….” Yet that is what the public in the USA has elected—a man who has little care for the future, nor for people, but has entered politics to further himself and the cadre of the superrich. The next four years will be a especially difficult for reproductive health issues. The new administration has pledged to get rid of Obamacare, which has put health insurance within reach of millions of people. One of its best benefits is the availability of contraception without copay. Furthermore, the proposed Health Secretary is a foe of abortion. There are actions bubbling up all over the country and they have already started locally. Dan Olson wrote about “Our 1st 100 Days”: “…a number of folks in the community are organizing a major campaign to combat the hate, fear, and lies so common in this last election cycle by growing and invigorating local efforts to advance social, environmental and economic justice in our community.” For more information: WWW.OUR1ST100DAYS.US. RESPOND is offering a day of free classes on January 21st. For more information: www.respond2017.weebly.com. The worst global crisis is climate change. Durango has already responded with a chapter of the Citizens Climate Lobby; https://www.facebook.com/DurangoChapterCCL/?fref=ts. CCL will be showing a video, “The Age of Consequences”, on Wednesday 15 February at both 5 and 8 PM. It will be at the Vallecito Room of the Student Union Building at Fort Lewis College. In mid-February “Truth to Power: Writers Respond to the Rhetoric of Hate and Fear,” will be available at Maria’s Bookshop. The scores of voices there, including Berry’s, collected and published by local writers Pam Uschuk and Will Root, can strengthen our resolve for the next 4 years. If you are unhappy about the direction our country is headed, join with your neighbors to regain control. Participate in local actions! Afterword: This piece is most relevant to the Durango area, but there is concern and action all over the globe–including a demonstration that was held in Antarctica! No one knows what is going to happen, but I am certain that the current administration will set back human rights–especially women’s rights–terribly. This work is licensed under a Creative Commons Attribution 3.0 United States.